4th call for proposals was closed on 3 January, 2019! 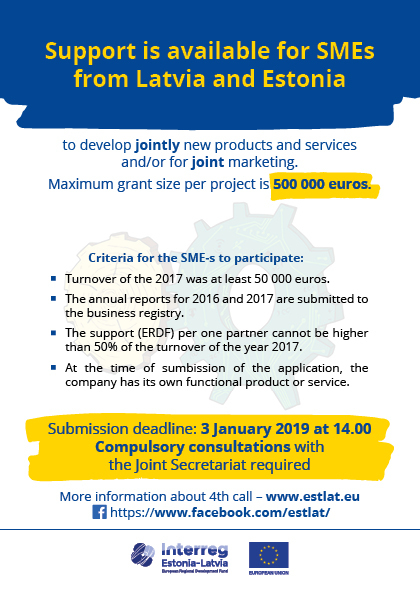 The 4th call was open till 3 January, 2019, 14:00 and by the set deadline 14 project applications (13 under SO 1.2. and 1 under SO 4.1.) were submitted in the eMS of the programme. Assessment of submitted applications will be performed from January till April, 2019. The results of the selection will be communicated in programme news on our Facebook and web news at the earliest in May 2019. 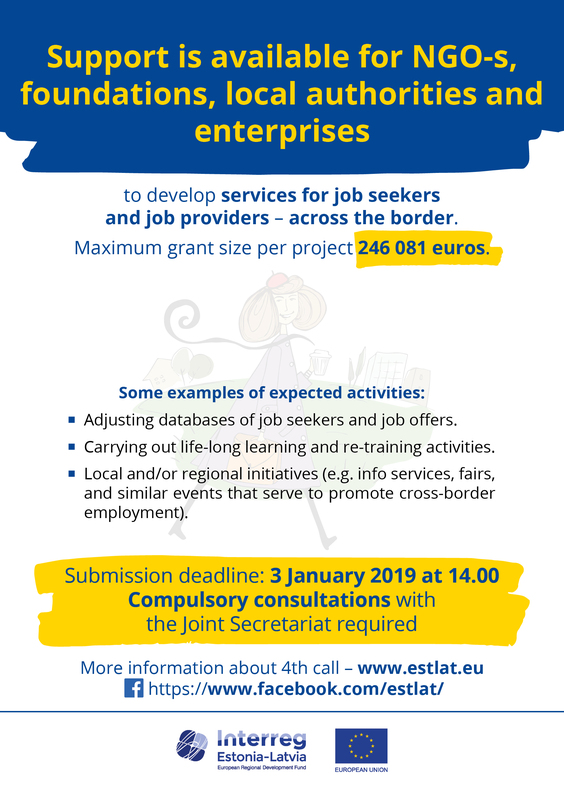 The 4th call for proposals was open from 24 September, 2018 and was thematically targeted to the Specific Objective 1.2 "More jointly developed products and services in the programme area" and the Specific Objective 4.1 "Improved conditions for accessing jobs across the border".
! 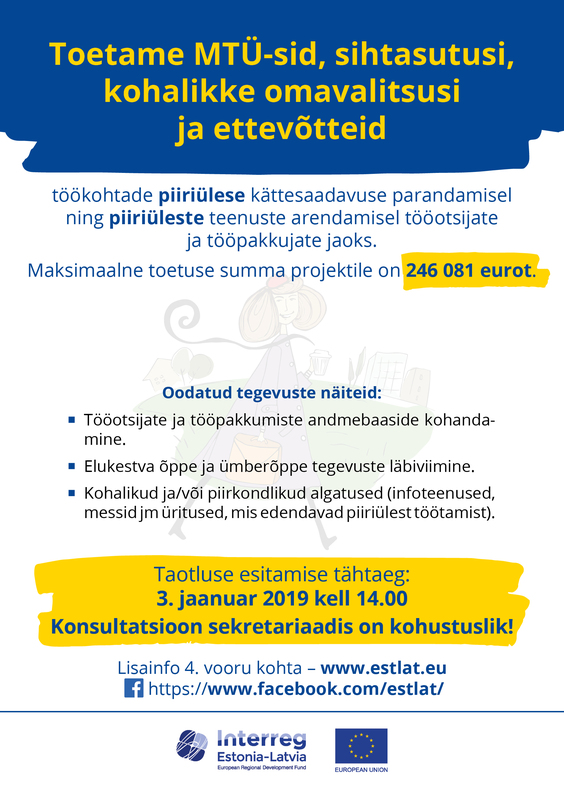 Important - consultations with the Joint secretariat before submission of project application are compulsory (technical eligibility criteria nr.1). Read more >>> and contact us >>>. 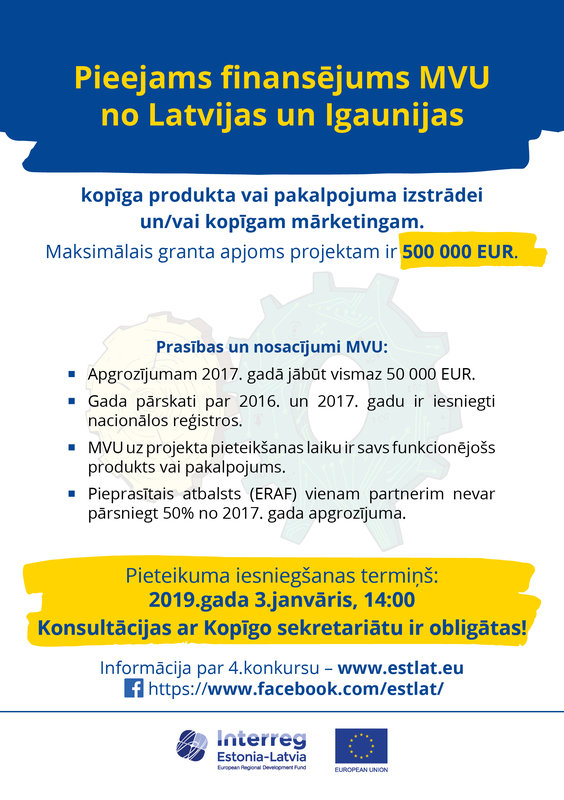 At least one SME from Latvia and one SME from Estonia, who are legally registered in the programme area and whose activities in the project are for the benefit of the programme area, must participate in the development of a joint product or service. http://eur-lex.europa.eu/legal-content/EN/TXT/PDF/?uri=CELEX:32014R0702&from=EN , Annex 1, Article 3. - If public sector owns at least in total 25% of the shares of the company, this company is automatically „large“, not SME. The number of employees or turnover shall not be taken into account. - In case a public university has more than 50% of the shares of the company, the company is large. If less than 50%, the shares will not be taken into account. 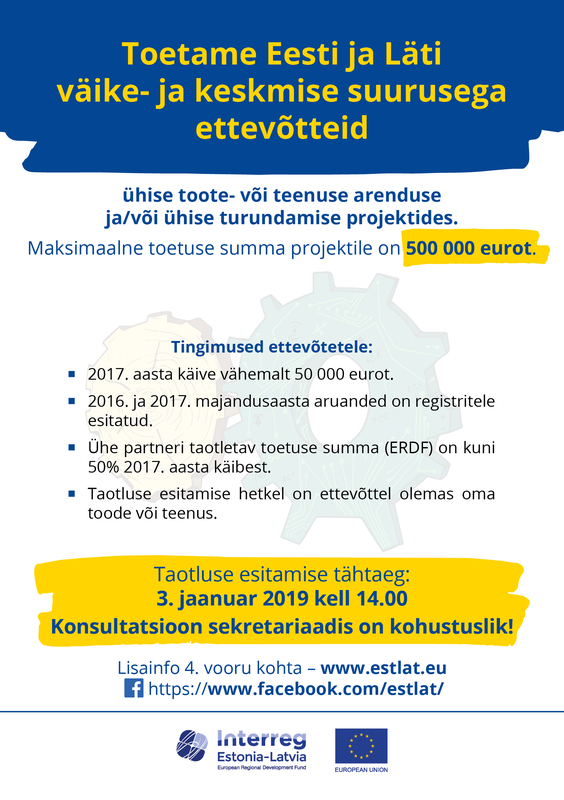 The participating SME must have at least 50 000 EUR for annual turnover for year 2017. The annual reports of participating SME-s for years 2016 and 2017 are submitted to the relevant national registries. Requested ERDF support for an SME can be maximum 50% of the SME’s last annual turnover. All participating SMEs must have their own functioning product or service at the time of submitting a project application. Projects can fulfil also only the second indicator. Examples of supported SME cooperation projects. For more information read the chapter 3.1 in the programme manual or consult the Joint Secretariat. Partners can be national, regional or local public authority, public equivalent body, private enterprise, non-governmental organisation, sole proprietor, who are legally registered in the programme area and whose activities in the project are for the benefit of the programme area. For more information read the chapter 4.4. and 4.5. in the programme manual. New and/or improved services for job seekers and/or job providers. Examples of supported labour commuters projects. Programme manual is the main binding document for 4th call applicants.
! Please note that the last version of the Programme manual file was uploaded on 27.09.2018. Publicity Guidelines inform you about the use of the programme Logo, requirements for reference to the funding of the programme and eligibility of costs related to the publicity of activities within the project. Costs related to fulfilment of these requirements can be included in the budget of the project. 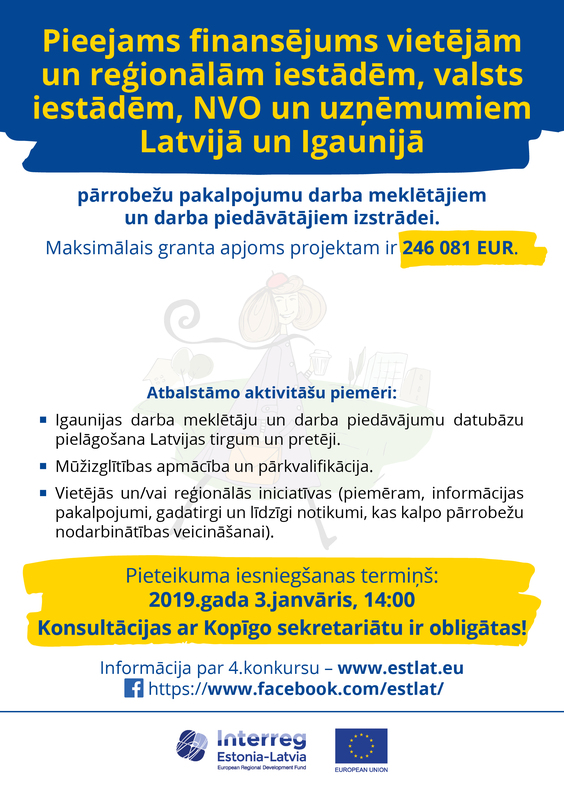 The project application has to be developed and submitted in the electronic monitoring system of the programme by 3 January 2019, 14:00. 5. Where the project activities include construction works or other works that fall under the regulation of the national building legislation, the supporting documentation has to be in line with the national building egislation. One copy of a full set of documents required under the national building laws, including building permit (ehitusluba/būvatļauja) must be submitted to the JS together with the application form. Consultation before the submission of the project application in the eMS is compulsory. Project partners must consult about their project idea with the Joint secretariat at face to face consultation in order to fulfill the technical eligibility criteria as described in the chapter 6.2.2.1 of the programme manual. Please read more about what qualifies as a consultation.